This student brief asked me to concept and develop an event that would assist in repositioning an organisation’s brand identity. 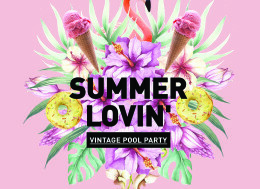 I developed the idea of a vintage-style Summer Lovin’ Pool Party at the heritage-listed Fortitude Valley Swimming Pool which is operated by the Brisbane City Council. For the design I developed a vintage-inspired collage using illustrations in Photoshop.